At the beginning of the new year, some subscribe to the philosophy, “Out with the old and in with the new!” Of the endless possibilities, perhaps, you’d like to lose weight, exercise more, stress less, get to bed earlier, declutter your home, arrive on time, or devote more time to family or personal pursuits. Whatever your goals, it’s interesting to look back on 2016 to see what worked for you, as well as what didn’t, and peek at some wellness and lifestyle predictions for 2017. 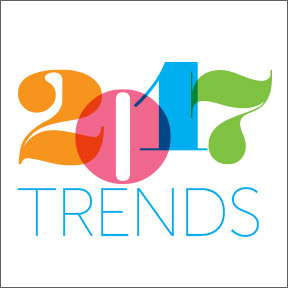 From fitness trackers, to exercise as medicine, to workplace wellness, to detoxifying yoga poses, 2017 is sure to be an interesting year. A trend is a developing movement that creates behavioral change. One such trend, influenced by progressive health conscious consumers, is redefining and creating an enthusiasm for real whole food. As health, wellness, and sustainability converge, people are proactively seeking out locally grown, sustainably harvested, humanely raised, and crafted foods, and are shying away from fat-free, highly sweetened, and industrially produced processed foods. Plant based diets – Interest in flexitarian, vegetarian and vegan diets is growing in popularity, not only for health reasons, but for ethical and environmental concerns as well. A plant-based approach to nutrition is one of the best for disease prevention, weight control and optimal health. Plant based proteins made from peas, chickpeas and lentils are expected to rise in popularity, along with fermented foods that support a healthy microbiome. Generally, people are reducing their consumption of animal products by adding vegan or vegetarian meals to their weekly menu planning. Eating ethically – Sustainability may be one of the most important trends to watch. Consumers are demanding healthy, nutritious organically grown foods, grass-fed meats and free range eggs and poultry. Despite efforts to squelch labeling of GMO foods, producers are responding to public demand. Expect to see this trend continue in 2017 and beyond. Food waste is out – A growing movement to end food waste will continue, as the realization that almost 40% of food in the U.S. goes to waste and 97% of that ends up in the landfill, contributing to greenhouse gases and global warming. Reducing your own food waste is beneficial to both your wallet and the environment. To reduce food waste, shop with a list and purchase only what you need. Supplements are in – Consumers have embraced the value of dietary supplements to support health and nutrition. Omega-3 fish oils, probiotics, superfood smoothies, collagen powders and multivitamin gummies are rising in popularity as easy ways to supplement a nutrient dense eating plan. Energy management – Energy is becoming a buzz word in terms of health and wellness. As more realize the very important connection between consumption, energy production and the inflammatory response, understanding the correlation between nutrition and wellness may become more mainstream. Physical activity for healthy aging – Beyond weight management, physical activity for every age group helps to maintain good health, fitness and independence. Staying active throughout life helps to decrease the risk of chronic debilitating diseases and allows for the maintenance of flexibility and balance. People of all ages now recognize that taking a personal interest in daily activity supports both cognitive and physical health. High intensity interval training – Sixty minute runs and bike rides are out, while shorter, more effective high intensity workouts are in. Think ten minutes of interval training comprising short bursts of exercise followed by ten seconds of rest. Start slowly and intensify as your limits increase. Boutique studios are in – Specialty studios, that offer a concentration in specific areas of interest, such as cycling, yoga or Pilates, often provide a more personal touch through highly trained instructors. Fitness trackers – Per its annual survey, the American College of Sports Medicine predicted that wearable technology will continue to be a top fitness trend in 2017. Everyone, it seems, is wearing a fitness tracker to help keep them goal oriented and accountable. Time to declutter – Donating items that are no longer useful is freeing and brings energy into your home and life. According to Marie Kondo, author of the bestselling book, The Life Changing Magic of Tidying Up, if an item no longer brings you joy, it has become a burden and it’s time to let it go. ON SALE Bone Broth Protein™ Banana Crème by Ancient Nutrition – Rich in protein, collagen, gelatin, glucosamine, chondroitin and minerals, this carefully crafted, gut friendly powdered formula supports immune, joint, skin and muscle health. Soy, dairy and common allergen free, Non-GMO formulation. Blue Green Superfood by Fortifeye® Vitamins – This paleo and IBS friendly powdered superfood mix provides American sourced organic berries, green superfoods and cinnamon with no binders, fillers or added fiber. Designed for overall wellness, Blue Green Superfood is Non-GMO, vegan, and gluten, dairy, corn and soy free. ON SALE Sport Oxylent Blueberry Burst by Oxylent – This science-backed supplement drink mix is formulated to support sustained energy, enhanced muscle strength, and reduced recovery time. As an all in one solution for pre-, during, and post-workout support, Sport Oxylent provides amino acids, vitamins, minerals, electrolytes and other select nutrients for athletes, exercise enthusiasts and the physically active. Gluten, soy and dairy free, Non-GMO formulation. Collagen Peptides by Vital Proteins – Sustainably sourced from pasture-raised cattle, this natural anti-aging protein supports healthy skin, bones and joints with highly bioavailable collagen peptides. Highly digestible and minimally processed, Collagen Peptides may be mixed with warm or cold foods or drinks. Gluten and rBGH free, Non-GMO kosher formulation. Adult Complete by SmartyPants Vitamins – This adult chewable provides bioavailable vitamins, minerals and omega-3 essential fatty acids. Third party tested to ensure purity, these naturally flavored gummies are gluten, dairy and shellfish free, Non-GMO and sweetened with organic cane sugar. ON SALE Vegan Garden Gummy Adult Organic Multivitamin by Nature’s Dynamics – This 100% plant-based gummy contains vitamins and minerals sourced from whole organic foods as well as co-nutrients and cofactors that aid in the digestion and utilization of the nutrients. Easily absorbable, these high quality, Non-GMO, great tasting chewables are gluten, soy, and dairy free.